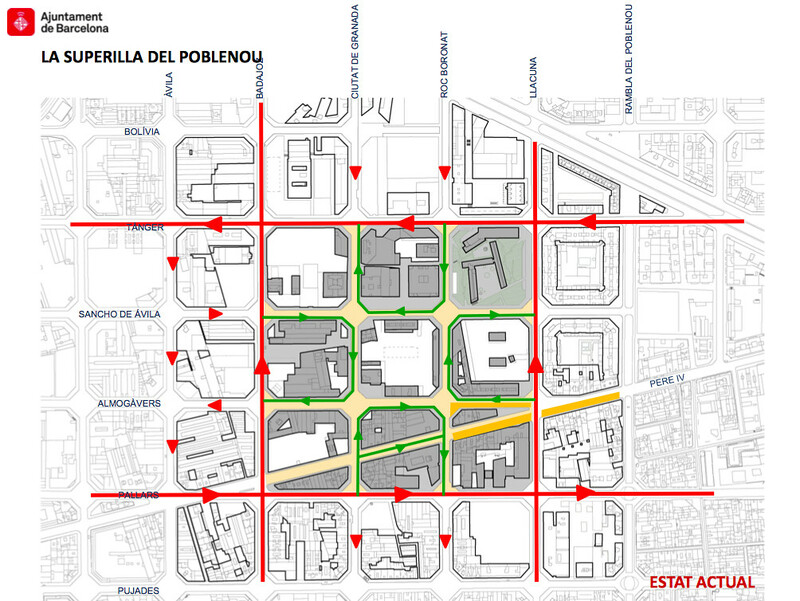 Above: Called superilles or ‘superislands’ in Catalan, the concept is that up to nine contiguous blocks are joined together and traffic within these blocks is restricted, as this diagram shows. Above: The entrance to the Superblock is made with colourful road paint, signs and road furniture. 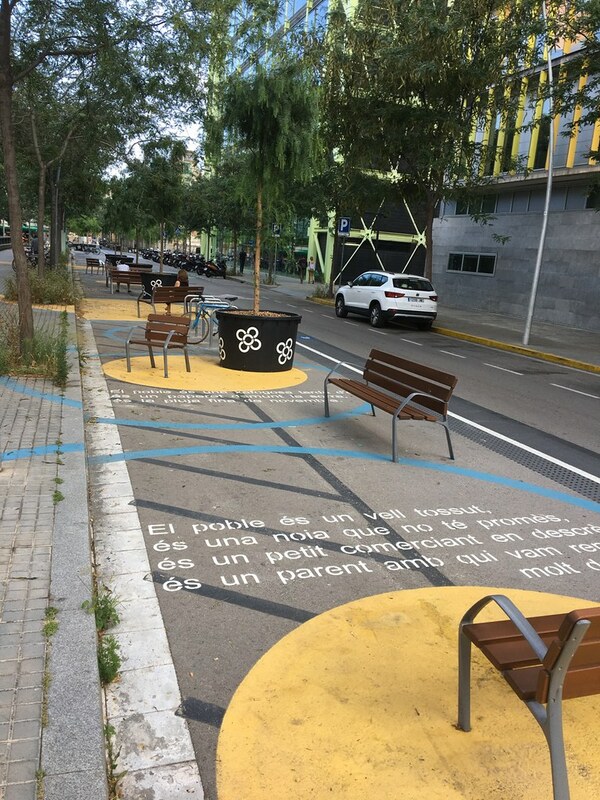 Above: The interior of the block is made liveable with benches and colourful road paint. Cars travel in one direction only and at very low speeds. 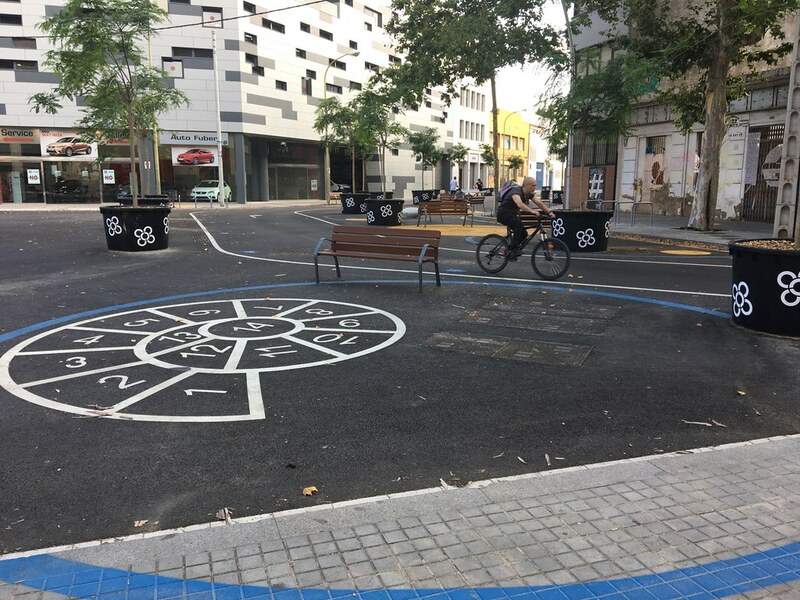 The entire Superblock is planned out in fine detail before construction, from the travel directions of all modes of transport to road signage, furniture and games. 8,000 square meters of open space were freed up by creating this Superblock. 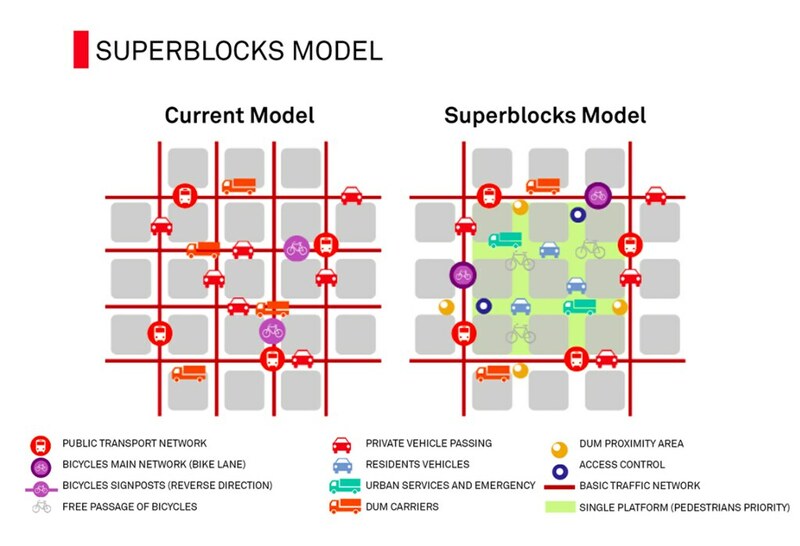 Above: Car traffic is restricted to local-access journeys only, and internal streets of the Superblock use a one-way system that allows acccess only in certain directions to certain blocks, so if you’re taking your car into the Superblock interior, you have to think through where you’re going. Through journeys -and short trips by car generally- are discouraged. 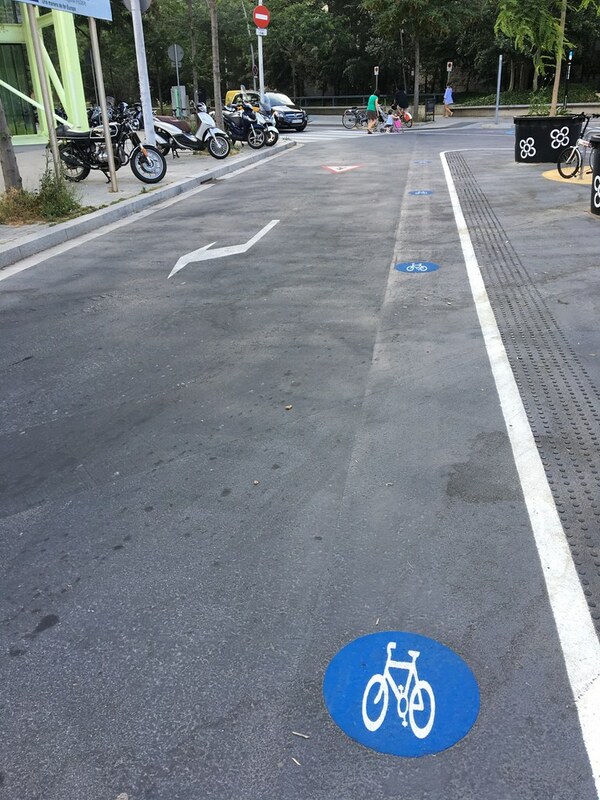 Above: Contraflow markings, low speed limits, scooter parking and vehicle charging station. 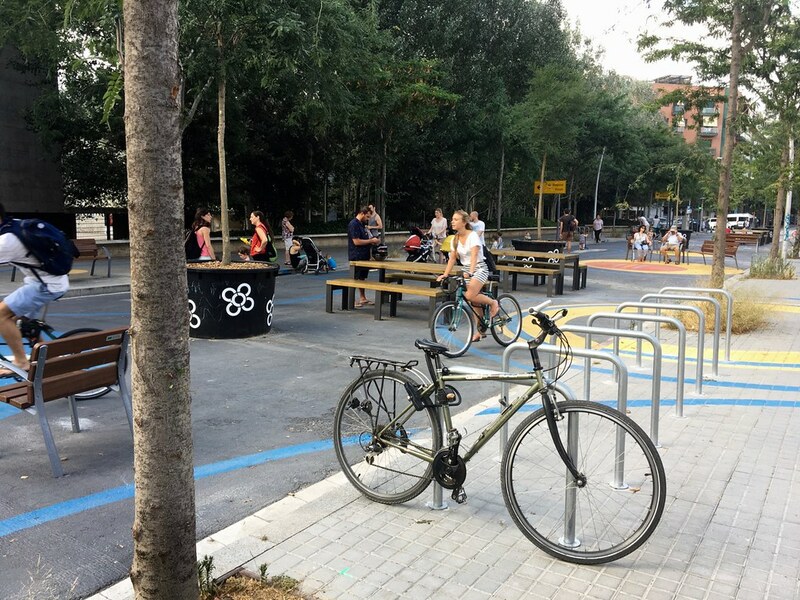 The original plan was that superblocks would cover the entire Barcelona city area by 2018, though resistance from some residents has threatened progress. 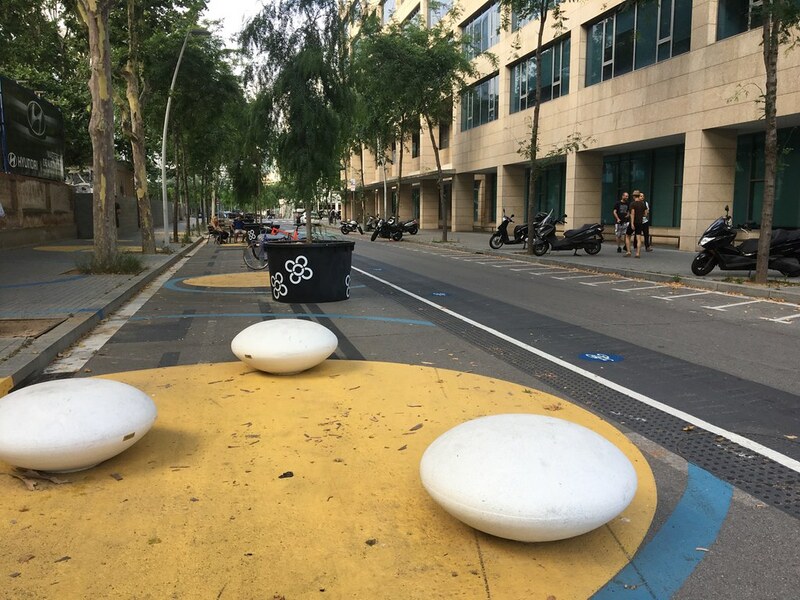 The five-circles flower symbol on the planter is taken the traditional panot paving sett used on footpaths throughout Barcelona. 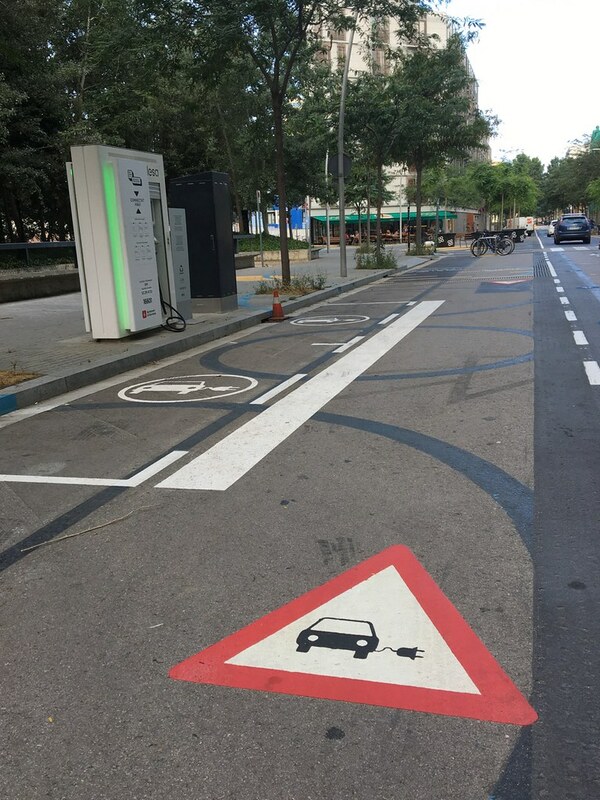 Above: Electric vehicle charging station. These are now common in cities throughout the EU. Above: Contra-flow cycle concept in junction. Most traffic is one-way, but cycle users can travel in both directions. The low speed limits mean this layout is relatively safe without any physical separation between directions. The internal streets are provided with the same contra-flow layout. Above: Block interior is made very comfortable. As this photo shows the community are really making use of this space. Previously it would have been entirely dedicated to parking and driving of cars. 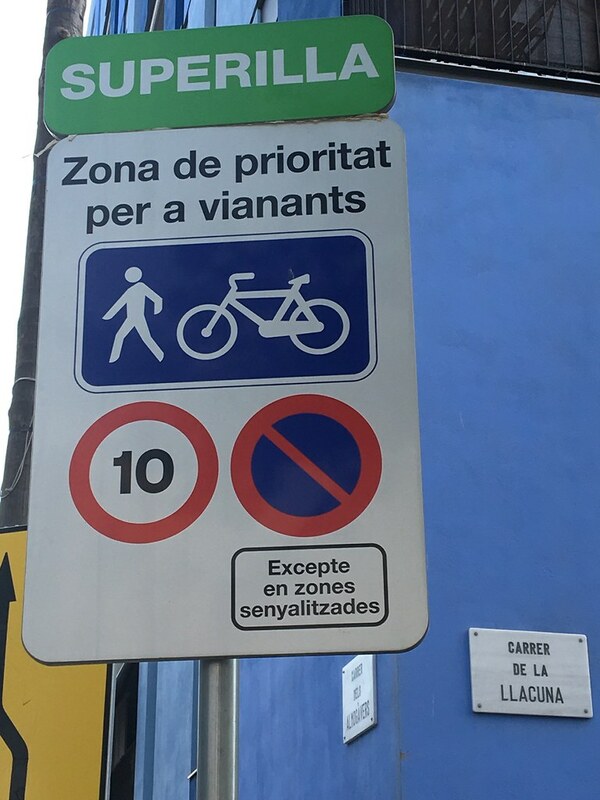 Helmet use by people on bikes is common in Spain but not mandatory for adults in built-up areas. Above: Little kids playing confirm the liveability of this space! A dad feeding his baby on one of the benches confirmed to me that these were mostly local kids. He also said that resistance to the concept was largely down to poor consultation by authorities with locals. It does seem to me that, for someone used to very convenient car use, the new layouts must take some adjustment. 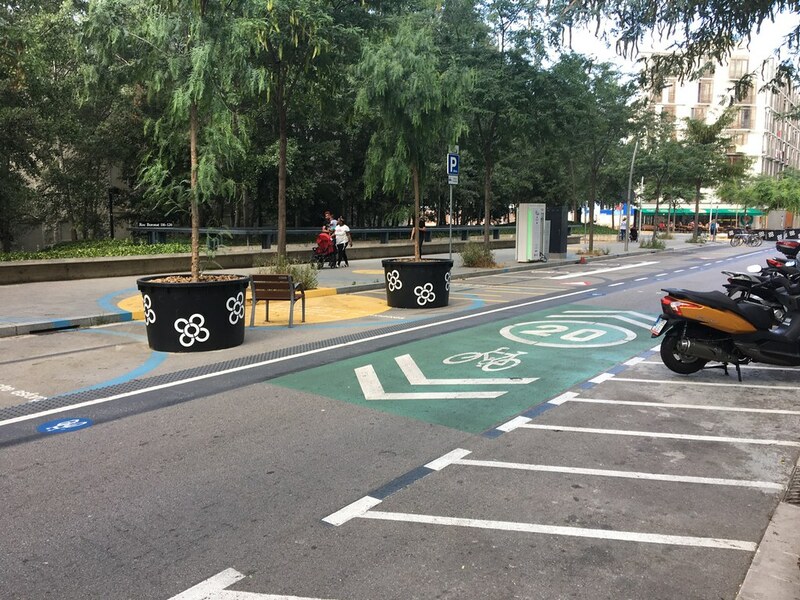 Above: Planters help shelter the play areas; bike-share station can just be seen on left; bike parking and ‘motos’ parking for motorbikes. Above: The principal signage. Where motorised vehicles are permitted, speed limits are very low. Above: Outdoor games! 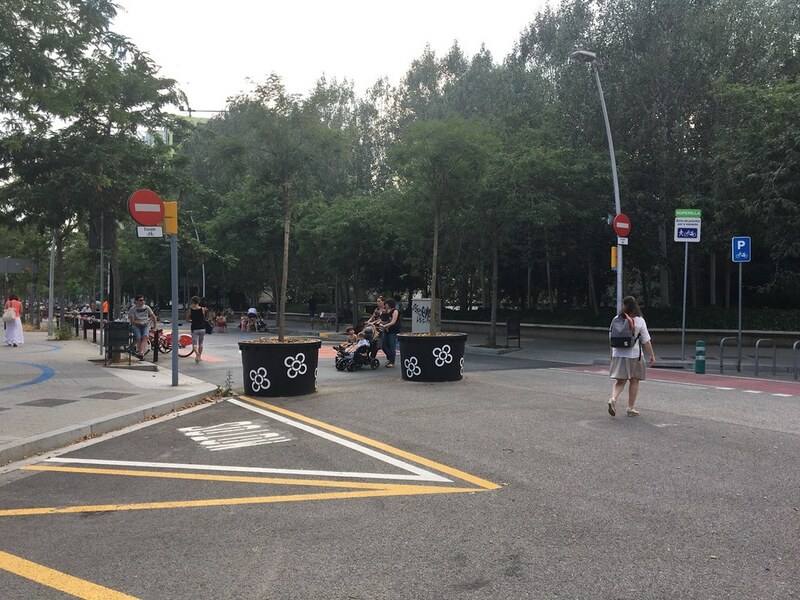 Polbenou is part of the geometrically-planned area of Barcelona, where repetitive rectangular blocks have been laid out with distinctive diagonal chamfers, widening each junction to form a minor civic space. 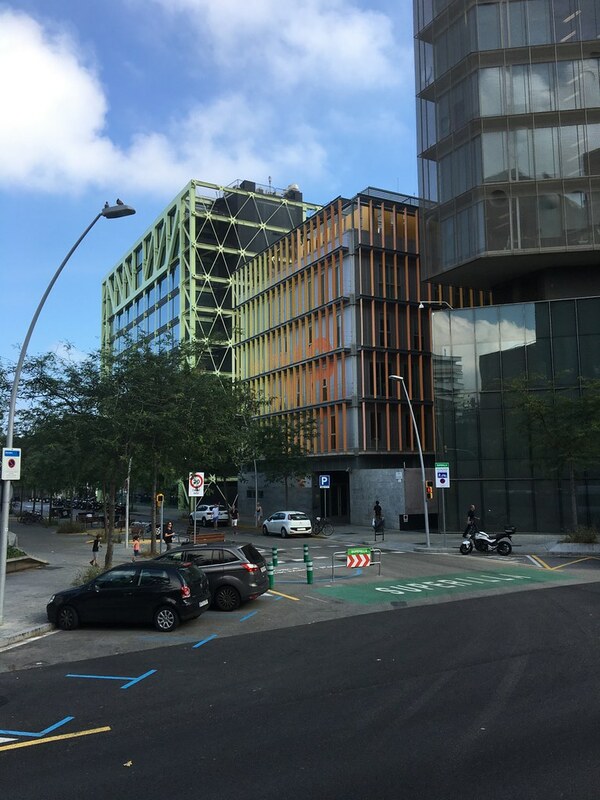 Poblenou has undergone a major re-generation in the past decade or so. Many buildings are new. Above: Funky street furniture. 200 architecture students collaborated to design the Superblock features. Above: Back to reality! Superblock ends here. 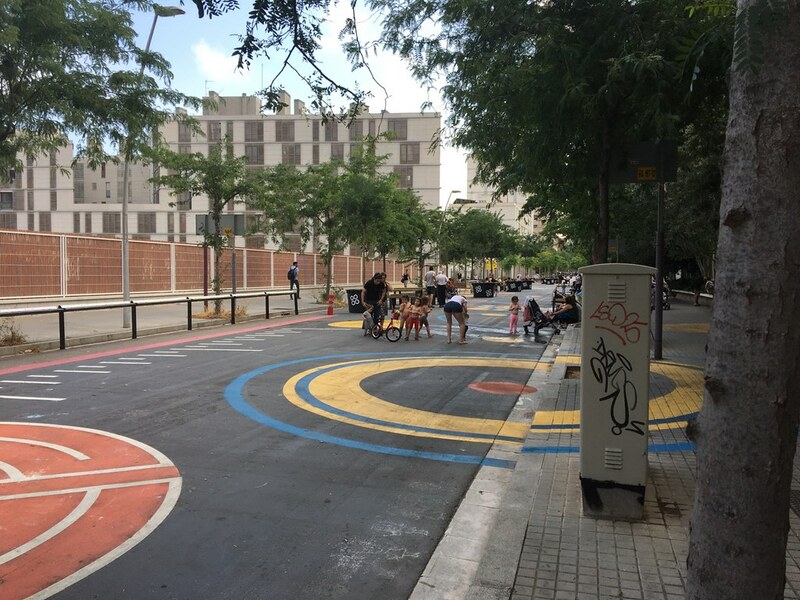 But the two-way bike lane visible beyond is of good quality and not atypical for regular Barcelona streets. The man here is on one of Barcelona’s Bicing bike-share machines. I flew in and out of Barcleona, which perhaps made me contribute more than my fair share to its air pollution. From the plane I could see the smear of brown smog that often hangs over the city. I hope that Superblocks help to make that sky a bit clearer, and I hope to take the train next time. Posted on 2017, December 9 by Will. 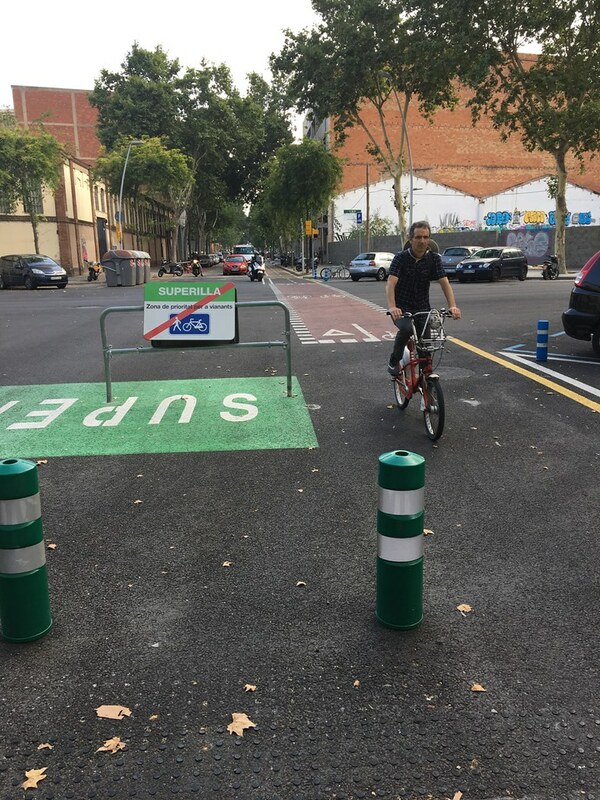 This entry was posted in Cycling, Photos, Sustainability, Transport, Transport+Urban Design, Travel, Urban Design, Will. Bookmark the permalink.